UNDER NIGHT IN-BIRTH Exe: Late st is a typical 2D fighting game in which you'll have about 20 unique characters available, each with their own combat skills and moves. Each of the characters can unleash devastating combos and attacks that will completely wipe out our rivals in either Story Mode or Multiplayer Mode. It has a multitude of unique game mechanics, such as "Veil Off" which can unleash powerful combos, "Cross-Cast Veil Off", we have access to special moves and other modalities that make it a unique fighting game. The story of the game tells us how since time immemorial, the Night Blade organization has acted as the guardian of what is known as "Hollow Night". The Princess of the Sword of the Night, Linne, meets a young man named Hyde, who is in possession of the legendary sword of fate she has been looking for everywhere for a long time. During Hollow Night, monsters called Emptiness feed on the power that manifests there, while those known as Unborn use that same power for their own ends. As she investigates the reason behind the sudden increase in the number of Void and Inborn on Hollow Night, Linne hears of an evil plot being plotted by someone who calls himself "Paradox. This person turns out to be none other than Hilda, the leader of an obscure organization known as "Amnesia". 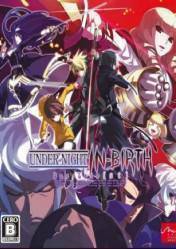 There are no comments yet about UNDER NIGHT IN-BIRTH Exe: Late st. You can be the first one!